Stanislaw Raczynski received his master degree (1964) from the Academy of Mining and Metallurgy (AGH, now called Techincal University of Krakow) in Krakow Poland, Electrical Engineering Department, his Ph.D. (1969) and Habilitation degree (1977) from the same Academy, in the area of control theory and optimization methods. In 1964 Dr.Raczynski joined the Institute for Automatics and Industrial Electronics of the Academy of Mining and Metallurgy in Krakow. From 1971 through 1972, he was head of the Computer Center of the AGH. Between 1973 and 1976 he worked as a researcher in the International Research Group in Moscow, USSR (located in the Institute for Control Problems of the Academy of Sciences of the USSR). The research area was operations research and computer simulation. In 1976 Dr.Raczynski became head of the Systems Analysis Group at the Academy of Mining and Metallurgy in Krakow. From 1980 through 1983 he participated in the activities of the European Workshop on Industrial Computer Systems. Between 1983 and 1986 he was a visiting professor of the National University of Mexico. In 1986 Dr.Raczynski joined the Panamericana University in Mexico City, Engineering Department. His didactic activities include courses on control theory, electronics and computer simulation. Between 1996 and 2000 and then between 2002 and 2004 Dr. Raczynski was the International Director of The Society for Computer Simulation. In 2003-2004 he is the international co-director of the McLeod Institute for Simulation Sciences (part of The Society for Computer Simulation in San Diego, California). Since 1996 he is a member of the National System of Researchers of Mexico. Between 1994 and 2003 Dr. Raczynski was the director of the Mexican Center of the McLeod Institute of Simulation Sciences. He wrote two books on computer simulation and has more than 70 articles and papers published in professional journals and conference proceedings. Discrete systems like queuing and manufacturing. Simulation of automatic control systems, both continuous and sampled-data. Model development. Given an informal system description, the consultant proposes the mathematical or logical model specification and implements it on the computer. Consulting in theory of modeling and simulation and control theory, including optimal control problems. Software tools: Dr. Raczynski is the author of the PSM++ (new version of PASION) simulation system and distributes this tool (see the short summary below). Other tools are target custom simulation programs elaborated according to the particular needs of the end user. The new version of PSM++ is called Bluesss. It generates C++ source code. Fluid dynamics and heat transfer tools. On a simulation experiment with a parallel algorithm for optimal control Transactions of the Society for Computer Simulation, 5(1), pp.87-97, 1988, San Diego, CA. Process hierarchy and inheritance in PASION, International Journal "Simulation" 50(6), June 1988, San Diego, CA. Graphical description and a program generator for queuing models, International Journal "Simulation", September 1990, San Diego CA. Simulación por computadora, (a book), NORIEGA EDITORES, 1993, Mexico City. Manufactura Integrada por Computadora, Tecnología de Grupos y Simulación por Computadora, Revista Estrategia Industrial, no. 120, XII 94/I/95, Mexico City, pp.12-15. Differential inclusions in system simulation, Transactions of the Society for Computer Simulation, San Diego California, vol.13, no.1, March 1996. When the system dynamics ODE models fail, International Journal SIMULATION, vol.67, no.5, San Diego California, November 1996. Coupling nonlinear models in object-oriented simulation: application to drives with multiple induction motors, in the International Journal "SIMULATION", San Diego, CA, February 1988. Simulating the Dynamics of Granular Media - the Oscillon Phenomenon, Computer Modeling and Simulation in Engineering, Atlanta Georgia, November 1997. On the Metric Structure in the Space of Dynamic System Models Transactions of the Society for Computer Simulation, vol 15 no. 2, June 1988, pp. 70-75. Alternative mathematical tools for modeling and simulation: Metric space of models, Uncertainty, Differential Inclusions and Semi-discrete Events, Proceeedings, European Simulation Symposium ESS2000, Hamburg, Germany, September 2000 (Keynote plenary speach by invitation of the Organizers). Continuous simulation, 60 pages article ordered by Academic Press, Elsevier Publ., in the Encyclopedia of Information Systems, 2003. Simulation of turbulence and oscillating gas flow: Applications of Fluids32.2 fluid flow simulator, 10th Workshop of the Polish Society for Computer Simulation, Zakopane, Poland, September 2003. Continuous Simulation, Differential Inclusions, Uncertaintly, and Traveling in Time, Simulation, Vol. 80 issue 2, February 2004, pp. 87-100, The Society for Modeling and Simulation Int., San Diego, California. A Self-destruction Game, Journal of Nonlinear Dynamics, Psychology and Life Sciences, pp.471-483, October 2006, USA. PSM++ and Blues Simulation System, Winter Simulation Conference - HLSLA07, The Society for Modeling and Simulation, San Diego, CA, January 14-18 2007. PSM++ is an object-oriented, Pascal-related simulation language. The language has a clear process/event structure and is equipped with appropriate environment. PSM++ translator generates Pascal source code that can be run using a Pascal compiler (this new version generates code compatible with the Borland's Delphi 3 or 4). The following features make PSM++ the most complete and versatile simulation tool. Efficient scheduling and event queue management. Inheritance mechanism, that permits to add new properties to old processes without intervening the source code of processes declared earlier. State events. Discrete and continuous objects can run concurrently. The state events can be activated by continuous objects as well as by logical conditions changed by discrete objects. The library of PSM++ predefined processes contains various frequently used processes, e.g. a rigid body dynamics, and several helpful processes that handle graphics and show simulation results. Program generator for ODE (Ordinary differential equations) models DIFEQ. Program generator for queuing models QMGW. This module includes graphical editor for queuing schemes, program and report generators. Program generator for continuous processes FLOWD described by signal flow diagrams or block schemes. Bond Graph editor and analyzer BONDW. This module includes a Bond graph editor and a program generator that creates source Pascal and PSM++ code for a given Bond graph model. PSM++ Animator. Includes a Scenario and Icon Editor that permits to create 3D scenarios for animated simulation. The user creates the scenario and defines the possible routes for model components and the component icons. A simple calls to an animation procedure from the source program makes the icons move according to the simulated component activities. VARAN: Post Mortem analyzer for stochastic (discrete and continuous) models. Shows variance, confidence intervals etc. as functions of time, particularly useful for the statistical analysis of transient processes. Complex System Simulator CSS - new versatile PSM++ module. Very useful for combined systems, permits model coupling. Submodels of different types (queuing, continuous, etc.) run concurrently in the same simulation program. Needs no or very little programming. Generates PSM++ source code. Object-oriented simulation offers great flexibility in model building. While coding directly in PSM++ language you can create complex models described in terms of processes and events, create the process instances (objects) and activate them. The above figure shows a simple model of breaking the rack, where each ball is a model object and moves according to its own rules, receiving external forces from other objects, friction and the table limits. This is only one of possible PSM++ applications. The whole system can be used to simulate a great variety of systems, from physical ones to queuing models, manufacturing, automatic control and many others. See the PSM++ demo (can be downloaded from the complete version of this summary) for the simulation run (animation) of this model. Consult also the journal SIMULATION (November 1997, J. & S. McLeod, "Simulation in the Service of Society") for a PSM++ review. Implementation: the PSM++ system runs on the (minimum) IBM 32-bits, 100 Mhz PC machine with SVGA color monitor (16 or 24-bits color), 16 Mb RAM. This is a highly abbreviated version of the PSM++ summary. Click here to see the complete summary. It has more text and figures and may load slowly. Be patient. An example of the output from PSM++ and Bluesss queuing module: average value and confidence intervals for the length of a queue in a mass service system, shown as a function of time. 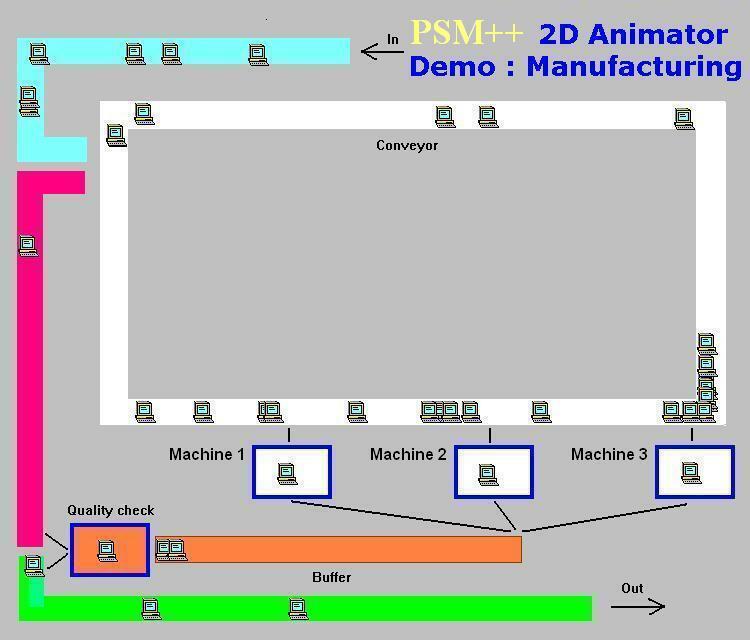 PSM++ and Bluesss animation: a manufacturing model. Here you have some simulation links. First of all, note that the first one is a link to the Society for Computer Simulation Interational (SCS). This is the most important source of simulation knowledge and information about simulation journals and events (conferences, workshops etc.). There are also some pages of the McLeod Institute for Simulation Sciences (MISS, a part of the SCS), and other useful simulation links.